Not on my M03 as it makes it drive worse. I shim about 50% out on my M05v2 and my M07 has no play at all. Everybody is different though. Does anyone shim the car to take all the play out of the suspension, axles and steering? I have. I saw a difference in transitions, but really nothing to write home about. Definitely nothing worth spending the couple hours of tweaking it took. are there any tamiyas that run a 4 or 5 mm thick PLASTIC hex? we have to run box stock so id rather not run alloy hexes and draw attention of the scrutineers. Box stock means what came in the box. You're still breaking the rules by using a different hex even if it's plastic. 5mm plastic hex (kit) plus sandpaper, plus a muzzle for gigaplex so he won’t bust you, would seem to be an optimal solution. I ran into the same thing w/ various bodies rubbing against the wheels in the M class. There were a a few bodies that seemed to work better than the others for this reason. A lot of Tamiya’s earlier mini shells, like their original Mini Cooper, were designed when Tamiya was selling the kits with 55mm tires. Pretty sure thy used 4mm hexes at one point, too. Some (thankfully few) aftermarket shells are based around a narrower track or 55s as well. I’ve been running Blitz shells for several years now with 60d tires, 7mm hexes and a few extra mm of wheel spacers on both sides, as well. Last edited by monkeyracing; 12-04-2018 at 12:20 AM. I used a spare trackstar 4250kv sensorless brushless motor and it seems to mesh nicely. Is there any performance difference in the SPEC #1016 S-Grip pre-made tire versus the build your own sets for TCS? Other then the color of the rims? Looking at that and the MG EVO side by side, there’s not all that much different, but I’d still go for the 3Racing. It doesn’t matter either way, however, as I’m trying to figure out where I put all my M03 parts at the moment. I'm having an old guy moment. I just got the Yeah Racing heat sink (Part number M05-013O2BU) for the M05, and I cannot figure out how to install the thing. 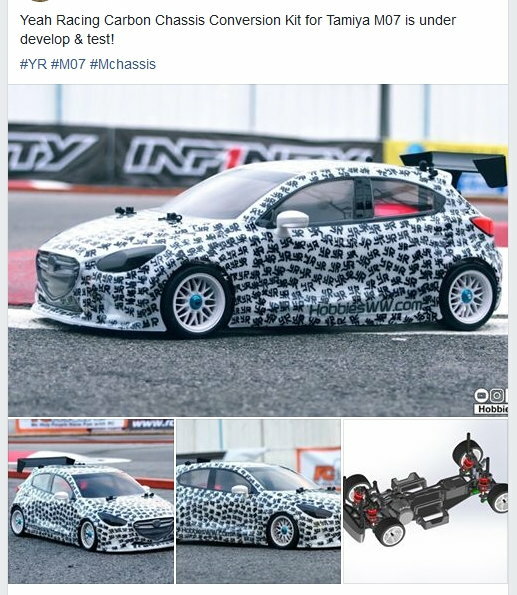 I have the M05V2 motor plate from Tamiya and though the Yeah Racing site says to use their mount, it looks almost identical to the Tamiya one. Any help would be appreciated. Link of the part is below. Pretty sure you need the Yeah motor plate as the screws from the sink go down into the plate. The Tamiya heat sink bars fasten horizontally onto the Tamiya alloy motor plate. what are the essential hop ups you need to make the M05 easy to drive? A group of guys I race with are pretty fast with their M05s I don't get it.... they have the same brushed setup and tires as me. But I know they have ball diffs and I have the stock gear diffs. Does the ball diff really makes a difference? I come from 2wd off road buggy so this is pretty new to me.... On road using ball diffs....usually when yiu have tons of traction in off road .. we use gear diffs.